As a gringo who’s always wanted to learn Spanish and know the Mexican culture, living in Tijuana has changed my life. But my decision to move south of the border didn’t just happen overnight. It was more of a gentle acclimation, initially as a San Diegan tourist. Living in San Diego provides us that unique opportunity. 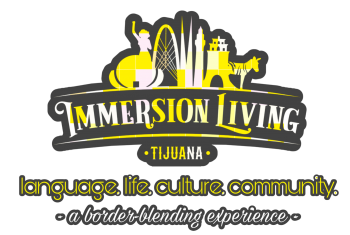 There’s all sorts of social groups meeting on both sides of the borders that can help you begin dipping your toes into the immersion pool. Learning Spanish and getting to know the fronteriza culture of Tijuana doesn’t just happen overnight. It takes time, sweat, focus and lots of leaving ones’ own comfort zone. But hey, that’s part of what makes living in a foreign country an unforgettable adventure. Thankfully, there’s lots of resources available to help you out. is written in both English and Spanish), but gaining insider knowledge on all that makes Tijuana a great city. A must read for anyone thinking of moving here. Coffeebreak Espanol – The podcast that started it all for me. Primarily in english, this podcast is a great beginners’ resource for learning Spanish. Greatest part; the European host speaks in a thick Scottish accent. News in Slow Spanish Latino – Just what it sounds like, you’ll hear news from the latin world spoken in a pace of Spanish slow enough for intermediate learners to understand. getting serious about gaining fluency. One downside; it’s English/Spanish-based (as in European), as opposed to what would be a more appropriate, in our case, USA/Mexico-based. It still crosses well though with most Mexican words and phrases. Youtube videos Subtitulados – simply search for many of your favorite songs/videos by adding “subtitulado” at the end of the title and you’ll often find versions with added Spanish translation. Great for reading comprehension. If you already don’t have it, get your SENTRI pass. What’s SENTRI? Next to crossing the border by motorcycle, this is the quickest way. It costs $150 to process the application and, once approved, will last five years before needing to renew. This is the quickest way to drive across the border. I have a friend who crosses the San Ysidro border five mornings per week at around 8:30am for work in City Heights, San Diego. He tells me his average wait time is 10 minutes. If you know you’re going to drive across the border frequently, apply for this pass today. From time of filling, I waited two months for my interview. Once passing my interview, I waited another two months to receive my SENTRI card in the mail.